Maybe these are questions that you have wrestled with your entire life. Or, maybe these are questions you have never consciously asked yourself before this moment. But, the fact of the matter is, we all have to ask them at some point. We all have to make a choice about truth. As Christians, our very existence depends upon truth: do we believe in Jesus? And if Jesus is not truth, then we serve nothing and become nothing. Whether you know your views on truth or not, we all come to understand truth through our own worldview. Our worldview is shaped by our culture, family, and experiences. Even if you have never thought about your own worldview or really even understand what it is, you have one. We all have one. We all look at the world with unique lenses and we come to understand the world through these lenses. This is why ten people can read the same book, but can understand it in ten different ways and walk away with ten different sets of ideas. Our worldview shapes how we make decisions in every aspect of our lives, and our worldview is also why we can find other people’s choices strange or unusual. Our culture is very independent, and we base many of our choices on what is best for ourselves; other cultures are more communally based and they make decisions on what is best for their entire family or community. Taking that into account, we at The Pearl Press want to help you, our reader, better understand your own worldview as Christian woman. For that reason we will spend the next four months walking through The Truth Project, discussing topics such as sin, marriage, racism, sexuality, money, healing, and social justice. To accomplish this, we will be changing up the formatting of The Pearl Press. Every Sunday we will focus our on the exploration of biblical understanding on each topic. Our hope is that this will help you begin to understand and even further develop your own worldview by looking in the Word of God. We are not trying to force you into agreement with our understanding of the truth, but we want to present you with what the Bible has to say about each of our topics and let you make a decision and come to your own conclusions based on that information. Following Sunday’s post, we will then share on Thursday our own stories regarding each topic and show you the various ways that each of them could impact your life and why this topic matters in regards to your own worldview understanding. 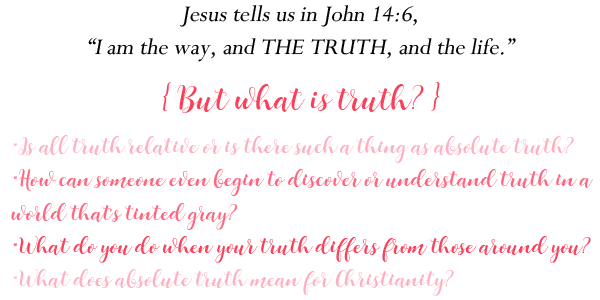 Our ultimate goal with The Truth Project is to help you confront and work through some hot topics in culture today and even within Christian circles. We want to empower you to come to a greater understanding of these topics and hopefully encourage you to engage with the people around you. I know that for a long time, I shied away from talking with people about certain topics because I felt I didn’t have the understanding or education to address the matters they were speaking of. I didn’t know what the Bible said about homosexuality or gender roles or what it meant to participate in social justice. I felt excluded from certain groups because I had nothing to contribute to their discussions. I couldn’t engage with non-Christians because I had nothing to counter their claims, and some Christians saw me as ignorant because I didn’t have a strong enough opinion on certain matters. We are praying that through The Truth Project, you will not have to suffer as I have in the past. That you will walk away feeling equipped to confront the culture you live in every single day.To create a space where you can engage and dig into these topics with us. A safe place to express your opinions as well. We want to hear from you over the next weeks and months! PLEASE feel free to share your thoughts and ideas as we work through these topics. And don’t be afraid to challenge the thoughts and ideas that we share each week! We want to be forever cultivating souls here at The Pearl Press and the best way to do that is together! 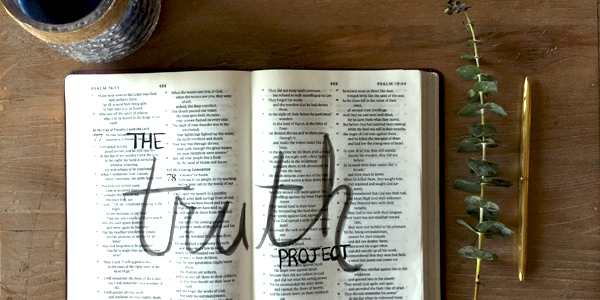 We hope that at the end of The Truth Project, you will have come to better know truth as it is presented in the Bible and make that truth a fundamental part of your life. Knowing God is knowing truth.